Cooler times ahead: indicators show deepening La Niña | Watts Up With That? As shown by the indicators on WUWT’s new ENSO/SST page there is a deeping of the La Niña that is starting to rival 2008 in depth. While it hasn’t yet reached the level of the 2008 event, indications are that it is possible to match or even exceed it. The graph above from Australia’s BoM took a dip just today, going from last week’s value of approximately -0.9 to -1.4C. The combined 3.4 index has been deemed a useful metric to gauge El Niño and La Niña events and thus you’ll see it more commonly referenced than the other indices. August 31, 2010 in ENSO, Sea Surface Temperature. As a complete beginner with sea temperatures – where does the warm water go during a La Nina? I has not cooled, as that would take longer than this. It cannot sink, as it is warm. Has it just moved north, rather like an equatorial hurricane, which drifts north as it turns into an Atlantic depression and eventually dissipates? We certainly now see more of a bias towards La Nina than we did in the late 20th century. This will be the first period when we can observe in enough detail to disentangle the seperate global implications of each mode of the Pacific Oscillations for the air cicrculation systems. Additionally the early 21st Century is already the first period when we can observe in enough detail to disentangle the seperate effects on the Polar Oscillations (and consequently all the air circulation systems) of different levels of solar activity. I think we are going to see just how independent those oceanic and solar influences can each be. I recommend that we watch how the air circulation systems move poleward or equatorward depending on which influence is the more dominant at any given time. The oceans may be more powerful but the level of solar activity working via the polar oscillations seems to set limits on the oceanic effects as regards how far poleward the oceanic influences can push the air circulation systems. Doesn’t La Nina bring warm winters to the U.S.? The graphic illustrates general patterns associated with El Niño and La Niña. So you see during El Nino the warm water heads north to be cooled off and La Nina is actually when it recharges. However I recommed you venture over to Bob’s site and read the full article and peruse his archives and you will get caught up on SST’s very quickly. On the other hand it is interesting that during El Nino time there was a hard winter in Europe last year. I can find no link however, MSM TV news broadcasts at least on channels 7 and 10 in Australia are reporting Sydney has just had its coldest winter in 12-13 years (Depending on the channel). It was interesting a weatherman on channel 7 was saying over the last several weeks that the “winters of old are back”, interesting. I doubt it’s directly correlated with La Niña or the voclanoes but ice extent has Increased the last couple of days! It depends on exactly where that blocking High in the NE Pacific sits, and I imagine that the ‘Variable’ in the Polar Jet Stream is a monkey wrench too. What I am most impressed with, right now, is the general state of the Southern Oceans. They are genuinely quite cool and growing colder. From watching the motions, a lot of the cold water appears to be feeding up from Antarctica. The little girl is being most cooperative! During a La Niña, the trade winds in the tropical Pacific renew and strengthen (they had weakened and reversed during the El Niño) and push the “leftover” warm water from the El Niño back to the western tropical Pacific. Ocean currents carry it north and south into the western North and South Pacific. The weekly NINO3.4 SST anomalies dropped below -1.5 deg C last week. Right now they’re rivalling the levels of the 1988/89 La Nina which had the lowest values during the satellite era. boballab (August 31, 2010 at 4:28 am): Thanks for the link and kind words. What is noticeable is how steep the drop is this year compared to 2008, does that mean that it is likely to go lower before pulling out of it’s nosedive? I’m trying to tease out the chicken and egg problem as regards the Trade Winds and SSTs. I see that you take the view that the El Nino with it’s higher SSTs weakens the Trade Winds and the La Nina with it’s lower SSTs strengthens them. I would say that the El Nino by expanding the tropical air masses pushes poleward the air circulation patterns that cause the Trade Winds so that they fade away whereas the La Nina by allowing the tropical air masses to contract again allows the air circulation systems that cause the Trade Winds to sink back equatorward so that theose winds resume once more. I think both descriptions are consistent with your observations are they not ? As expected this La Nina is on track, the northern hemisphere in parts can expect severe conditions this winter. The AAO is assisting the La Nina downtrend along with the general PDO state. The next PDO reading should be interesting. The low solar output will compound these issues with the expected changes to the winter jet stream via low EUV. But there may be worse news to follow, a new type of sunspot that has emerged over the past 2 months that has a polarity reversing tendency actually reduces F10.7 Flux & EUV. Its early days but one metric to watch. In the last few weeks, the source of cooler water for a La Nina, the subsurface circulation pattern shown in this graphic. …. has cooled off even further. Generally, it is 3C to 9C below normal and will slowly make its way to the surface (and/or cool off the water at the surface) so this La Nina is now certain to cool off even further and become a large event. There has never been a Super La Nina (more than -2.5C in the Nino 3.4 index, the largest was -2.24C) but this one now has the potential to get there. Expect the forecasts to reflect this cooling of the subsurface in the next forecasts. Someone asked where does the warm water go during a La Nina? It piles up against the shallow Indonesian Islands at the equator to form the Pacific Warm Pool. Some of this warmer water then flows through the Islands into the Indian Ocean, some goes northwest towards Japan (and eventually warms up the north Pacific) AND some of it gets pushed downward, just north of New Guinea, to re-enter this subsurface circulation system where it is now forming the next El Nino for about 1 year from now (unless this La Nina gets big enough to form a 2 year event). One can now see this warm water from the last El Nino in the animations above. It is a continuous circulation that speeds up and slows down and moves around a little; in other words, an oscillation. My theory is that abnormally warm water in the tropical Pacific ends up in the Arctic ocean where it appears to go into the latent heat of fusion in Arctic ice melt. It takes 144 BTUs to turn one pound of ice at 32F into one pound of water at 32F. 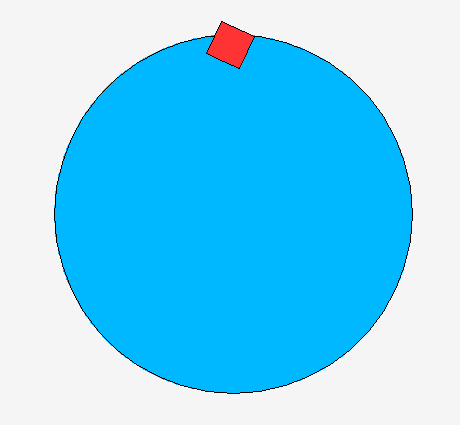 A BTU is the amount of energy it takes to raise one pound of water by 1 degree F. Most interesting is that this heat is called “latent” because it doesn’t register on a thermometer so when we look at sea surface temperatures the warm water just disappears like magic with no thermometer able to find it. In the few years following the 1998 El Nino, which was one of the largest on record, the Arctic ice cap shrunk by 1 million square kilometers and has stayed shrunken by that amount since then. 2011 will be cooler then 2008…. SOI for August is still strongly positive finishing at 17.09. Sorry off topic but just to wish you all the best Mr Watts. As Joe Bastardi and Steven Goddard point out Arctic ice should grow substantially this winter. La Nina will help. I think there will not be as warm an Atlantic next summer as this summer. Which would slow Arctic ice loss next summer. The earth is cooling now, slowly, but it is cooling. Climate has always changed. It is normal. Global warming is not happening. CO2 does not control climate. Global SST has not yet begun it’s plunge. It appears to be hovering in recent months with no indication from what I can ascertain will drop this month by any significant amount. Then again that is my amateur opinion. This El Nino is most interesting. (click on El Nino “status” in the right column) shows that the Nino 3.4 index dropped to -1.5 deg C. That’s already strong enough. Only twice since the 1980s, the 3-month average La Nina index dropped below -1.5: during the 1988/89 and 1999/2000 episodes. Still, I am not quite sure whether even a “giant” La Nina will necessarily mean some unusual cooling. In particular, I still do expect 2010 to be 2nd (and maybe, less likely, even 1st) warmest year on the satellite record. But what causes the trade winds to slow and reverse? The Earth is still turning the same direction. What else has changed? My possibly really retarded question involves the apparently very, very cold upwelling about 20 N Long, 38 W Lat. What causes this, or is this an island artifact? Cape Verde, or ? Not only the coldest winter but also the wetest across Australia. We don’t seem to be getting closer faster to the firy perpetual droughts we’ve been preparing for. Jorgekafkazar, this is the million dollar question. I read that minor changes in the time of the day, or planet rotation, cause it.. I don’t believe you can tease out the chicken and egg problem. ENSO is a coupled ocean-atmosphere process. An increase in SST in the West Pacific Warm Pool increases convection and the strength of the trade winds, and an increase in the trade winds increases the temperature in the West Pacific Warm Pool and the convection. And I will ask, as I normally do, what data do you have to support the expansion of tropical air masses? Without data, I cannot confirm your claims. While the La Niña formed over the last few months there was a strange heating of the atmosphere during July and first part of August. Before that it seemed the El Niño was waning. Any theories for why the “delay” occurred? The Icelandic volcano? The fast melting of Arctic ice? The lack of hurricanes? Nice synopsis, could portend coldening but best to wait for events to unfold. I am beginning to think this a testament to H2O greenhouse effect via increased cloudiness and humidity in Troposphere. On the flip side, oceans integrated less solar energy over the Modoki period. Indeed that too. Lake Eyre “filling up” and many other water ways and “dry spots” getting mildly moist. Sort of a ~100 year event, which is, errrmm, normal for Aus. In New South Wales, “authorities” are “back burning” upto about 35% more than last year. Well, last “summer” was a non-event for “summer” and bush fires. This summer, well, the goal posts have moved, haven’t they? You’ve reduced the complexity for us, much obliged. I once wrote a post called “The Trade Winds Drive the ENSO” which provided a pretty compelling case that the Winds and the ENSO are strongly linked. I also noted that I wasn’t sure what mechanism drove the Trade Winds to strengthen or lessen. Today, I would reverse the title and write it as “The ENSO Drives the Trade Winds”. It is the general temperature of the equatorial Pacific, itself, which determines where the air is rising the most, where the convection clouds are developing and how strong and where the Trade Winds are blowing. When the equatorial Pacific is relatively cool, little air is rising, no clouds are devloping in the Pacific. The convection and the clouds are developing in Indonesia. The Winds pick up and blow right across the Pacific to replace the rising air there. When the equatorial Pacific is relatively warmer, most of the tropical convection occurs at the International Date Line and in Nino 3.4. The winds are then low (it is mostly rising) and might even blow from Indonesia toward the warmer area in the central Pacific and drag the Pacific Warm Pool water along with it. It is the equatorial subsurface and surface circulation of warmer or cooler water that drives this whole system. It is both self-reinforcing to a certain point and then it becomes self-limiting. Cool will increase the Trade Winds and cause even cooler water to well-up. The warmth of an El Nino will eventually escape to space and cooler water will eventually warm up from the Sun and the lack of cloud. The ENSO, itself, drives the system and it is self-reinforcing up to a certain point and then becomes self-limiting awaiting the arrival of the next tranche of cooler or warmer water from the subsurface circulation, which alternating cool then warm and so on. !?! 2008 bequeathed 3 all-time evening lows on us, already a few fall like days have interrupted summer. I love these “unusual events”. There are around 200 countries in the world. There are many different meteorological measurements of which: Temperature, rain, wind are the most common. Counting all the “driest” and “wettest,” hottest/coldest, windiest, becalmed as possible “extremes”, there are some 1200 “extremes-country” events each year. If as the Met Office do, you also subdivide the year into four quarters, then there are some 4800 possible extreme events each year. If these were all independent (which they aren’t), then there would be some 12 to 48 extreme “100 year” events each year. The real question of interest is why we have so few extreme events? The answer is that only a few places have the kind of hotels that journalists like to visit. If during La Niña the seas save heat for the Niños to spend, then this La Niña will do it poorly as her salary from the Sun has lowered, so feebler el niños or more la niña are to be expected. Is this so? jorgekafkazar & Juraj V.: Google “initiate el nino” in quotes and there are 152 results. Scanning the first page, very few of the initiators are the same. BTW, How do you expect the weather to be for the next Global Gobernance (A.K.A. Climate Change, Global Warming) jamboree at Cancun in november? Very observant of you, Geoff. 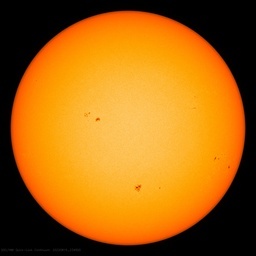 This new type of sunspot is par for the course for SC24, the renegade cycle. 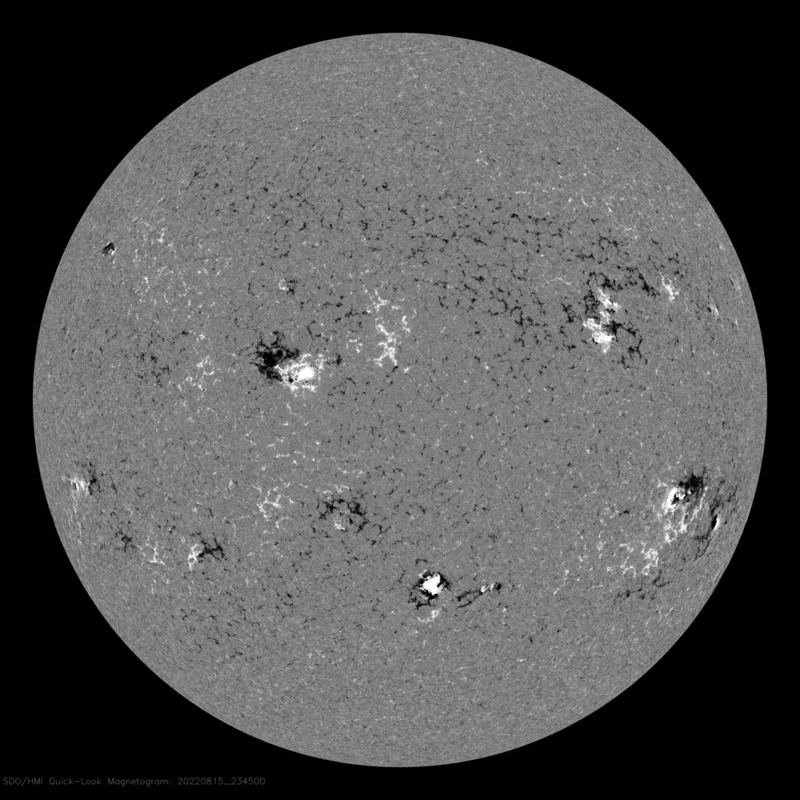 I’ll have to look through my composite EUV w/sunspot overlays to see what else they are doing. Nonetheless I note your opinion that one cannot tease out the chicken and egg problem. I beg to differ. The thermal energy of water is so much greater than that of air that as a basic first principle the initiator of any new trend in any coupled ocean air interaction must always be the ocean. I don’t need data to assert that additional energy released by a larger or more intense area of warmer ocean surface is bound to create a larger overlying warmed air mass than would be created by a cooler ocean surface. Similarly a larger area of snow cover or a colder landmass will create a larger overlying cooled air mass than a smaller area of snow cover. Sometimes a grip on basic first principles is good enough especially when as here no one has ever measured the total size of the tropical air masses as they respond to changes in SSTs. The distance between the sub tropical high pressure cells in each hemisphere might be a good proxy but who has ever checked that out ? All that has to happen is for the atmosphere to be acted upon to increase/decrease the albedo of Earth, then the Solar Energy need not change much for the Nina/Nino oscillation to move to a higher/lower baseline. GCR’s, ACR’s and Negative Sunspots afflicting EUV would fit this requirement I suppose. well we had snow over the weekend and ice on the car window this morning. brought me to tears! i just hope it hits the theatres before the world ends in 2012. People need to know that it could get cooler. Overpriced energy in a time like this is an extremely bad idea! It wasn’t very seasonable at 2350 feet either. Just mention ‘early fall’ and watch heads pop up or turn around, as if on cue. a new type of sunspot that has emerged over the past 2 months that has a polarity reversing tendency actually reduces F10.7 Flux & EUV. This is not a new type of spot. Solitary spots like that those do this all the time. The spot does not reverse its polarity as it crosses the disk. It does not know that you are watching and does not know about East and West. What happens is that the magnetic field in a spot is not vertical everywhere but bends down towards the surface at the edge of the spot. The magnetograph observes the line of sight field and because of the Wilson effect will see more of the Western edge near the East limb and of the Eastern edge near the West limb. This causes the apparent field to change, not the real field. As would the equatorward shift of the cloud bands which has been developing since at least 2000 and which is roughly correlated to the commencement of the ongoing rise in albedo. So a quiet sun shifts the cloud bands equatorward, increases albedo by changing the angle of incidence of solar shortwave onto the clouds, reduces shortwave into the oceans and thereby reduces the baseline amount of energy available for El Nino and La Nina. In order for that equatorward shift to occur the temperature of the stratosphere needs to rise so that the inversion at the tropopause is strengthened, less energy escapes upward and the polar high pressure cells intensify and migrate equatorward but that is not supposed to happen when the sun is quiet. Conventional wisdom is that the stratosphere warms with an active sun and cools with a quiet sun. That is the problem that needs to be resolved. Looks like a repeat of 1997 – 2000. If scientists are paying attention we could learn a lot during the next few years. But that is only if they have open minds and take off the “CO2 causes everything” blinders. Cold and snowing on summit of Mt. Yale (14,196′) in the Sawatch Range of Colorado yesterday. The tundra vegetation above 12,000′ has bronzed and Aspen leaves are already turning golden above 9,000′. Autumn is already underway in the Colorado Rocky Mountains. Thanks for the posting and all the good comments and links. Someone reading posts on the web might get the idea that except for Arctic Ocean ice and SSTs in the Equatorial Pacific nothing else is going on in the world. Apparently, the flux goes down in response to these ‘lone spot’ things in SC24. I went back 2 months and looked it over. Geoff has the observation: Kudos to the ‘Sharp’ eye for picking it out. If that is the cause for the flux decoupling from the SSN, it’s a dandy. The EUV response is a tad bit more interesting than TSI, which turned out to be a dud. Yes, we want to know how this thing works, this TerraClimate. Nothing is immune to being chased down. The flux [and EUV] does not come from the spot but from the corona above the spot trapped on magnetic field lines. For a bipolar large spot, the magnetic loops from one polarity to the other polarity reach relatively high up in the corona so we see enhanced flux and EUV. For a single spot, the magnetic field closes down near the spot to small opposite polarity patches, so there are no large loops up into the corona, and thus no enhancement of flux and EUV. This nice pattern can be obscured by other active regions on the disk as the Flux is an average over the disk, so you generally only see it clearly at rather low general activity level. so you generally only see it clearly at rather low general activity level. would this be the case for apparently reversing polarity spots as well? Geoff, that is an interesting and important observation (if it persists, of course). Polar magnetic field is steadfastly refusing to give way, and is not far down on where it was some 5-6 years ago. My equation suggests that magnetic field should fail to reverse on the next cycle max (11-12 years from now, around 2022) but the sun may be playing a little game. Bad news, I have to redo phase on the Hale cycle, good news I may have predicted a polarity change failure. Can’t win them all. Wonder re: EUV how the ramp in solar faculae is coming along. May be more important than solitary spots. Sharp’s observation on the non-linear flux/SS relation might be due to a lag in faculae and/or concomittant unexpected relation in faculae/SS/flux. No, no spots are ever reversing. 2-3% of all spots may have reversed polarity from what they should have for the cycle they ate in, but that seems to be quite random. Geoff, that is an interesting and important observation (if it persists, of course). As I have pointed out, this is not a ‘phenomenon’, but an observational artefact. Polar magnetic field is steadfastly refusing to give way, and is not far down on where it was some 5-6 years ago. The polar fields have [as they should] decreased ~30% from their high in mid 2006. It also suggested that the field failed to reverse around 1900. But it did, so there is already refutation of your equation. That changing polarity, not surprinsingly, it is turning the spin contrary wise to establishment desires. Interesting times ahead!, every time the possibility of a change appears there only two choices: either accepting it or opposing it and suffer. Baking hot here in Eastern Canada (yet the leaves are starting to turn-as it has nothing to do with temperature). Continues one of the warmest summers I have experienced. Spring and Winter were also several degrees above average according to the official records. I understand that North East U.S is also in the midst of a heatwave. PS The return to “normal winter” temps in S.E Australia this winter –after 12-13 years– only goes to show how warm it has been in S.E Australia over the past decade. Most people who lived through the decade of drought and bushfires in S.E Austrlaia will be waiting a little while longer before claiming things have returned to normal. I linked this earlier on this thread. If one Googles “initiate el nino” in quotes, there are 152 results. Consider this. A Rossby wave or Kelvin wave (a coupled ocean-atmosphere phenomenon) can leave the ocean and cross land as an atmosphere-only phenomenon. As it encounters the ocean again, it then returns to a coupled ocean-atmosphere wave. In that case the atmospheric portion enabled the ocean portion. Maybe you could find some papers on the impacts of El Niño on Hadley Circulation that would reinforce your claims. What dataset would be used to determine the “distance between the sub tropical high pressure cells in each hemisphere”? I’ve shown you that the AO and AAO, when used as proxies for latitude of the jets, etc., don’t confirm your assertions. Suppose the dataset you select now doesn’t confirm your claims. …that your paraphrasing was incorrect. That is, you rewrote what I had written to reinforce your opinion, when what I had written does not agree with your statement. Looks to me to be more about ignorance, yours and his. Polar field was for the first time measured as late as 1960’s. If SS change polarity during their lifetime, than C14 oscillations are not guaranty of the SS’s polarity either way, in addition PF does not modulate C14. It is surprising that you can categorically state what the PF polarity was some 60 years before it was measured for the first time. Remember Severniy, the top solar scientist of the time, doubted accuracy of his observations (in the early 1960’s) when he for the first time observed the PF polarity change. “Apparently, the flux goes down in response to these ‘lone spot’ things in SC24. I agree, Geoff’s brilliant discovery that the reversed spots reduces F10.7 flux is a possible explanation of why SC24 still hasn’t cranked up yet. If this continues I wonder if we will end up with a situation like SC4/5, with little activity over a full Hale cycle? Be interested to see what shows up on your composite EUV w/sunspot overlays when you get the time to do them. Whatever the reason, the early stats showing the decrease in Flux and EUV during rogue spots warrants further investigation. The EUV figures will be available for 1101 in a couple of weeks. One thing is for sure, the rogue spot adds nothing to the cycle. Leif has a link to some STEREO 3 band archives I have done (haven’t updated it in a while). I think that the focus on the Pacific (ENSO) is unfortunate. It leads to conceptual errors and red herrings in relation to causation. Warming: Rising pressure at the poles robs the mid latitudes of the pressure that drives the trades. Cooling: Falling presssure at the poles and rising pressure at mid latitudes, particularly in the northern hemsiphere, accelerates the trades, increasing ocean surface area, thereby increasing evaporation while forcing the upwelling of cold water in the eastern margins of the ocean. It’s official – Adelaide has just shivered through its coldest winter since 1997 and its wettest since 2005. With the end of winter yesterday, Bureau of Meteorology figures have recealed the average maximum temperature from June to August was 15.3C – 0.7C below the average. The nights were also colder at 7.4C, below the usual winter average of 8C. The coldest day was July 18, at just 11.5C, while the coldest night was 2.2C on June 14. In July the city had the longest run of cold nights since 1982 – six in a row below 5C. From what I can surmise, the faculae are doing a LOT better than the spots. The big problem is that the way they are done today breaks calibration with the photoheliographic/sunspot drawing records. Faculae are not mentioned during the Maunder (they were observed before & after it), and no drawings are available from the Dalton whose surviving record is sparse. That’s easy. The Rossby wave is coupled to the global oceans as a whole and not just the bit of the globe over which it is situated. The oceans enabled the Rossby wave throughout. Even Leif goes for a ‘bottom up’ process. I’ve told you that the correlation may be poor in the short term but the longer the timescale the better it holds up. The reasons being that the oceanic effect is constantly being modulated by the solar effect on the polar oscillations (AO and AAO) and the jets are slow to move being tied to the global trend in the energy budget so the frequency of individual ENSO events shows little immediate effect. Difficult because the El Nino effect on the Hadley cells is modulated by the solar effect on the polar oscillations. However it is clear that the Hadley cells also change position over time such as between MWP, LIA and Current Warm Period. Also it is a poorly studied issue. Until a few years ago it was being said that the only reason for the observed poleward shift of the jets in the late 20th century was human CO2 emissions. That has been scotched by more recent events. I have already told you that there isn’t one. We are in broad agreement but certain details are still to be resolved. It is surprising that you can categorically state what the PF polarity was some 60 years before it was measured for the first time. we have been over this before. The polarity of the polar field can be determined accurately from geomagnetic activity which is known back to the 1830s. they are not reversed, just single, and I’ve already explained why that happens in any and all cycles. You have a point there: They have shown up on both leading & trailing, but when they do occur, it’s usually solo (occasional blinker) and this is our Mainstay Feature as far as sunspots go. Still, Geoff did spot the drop in flux coincidental with these Alpha Cyclops, and, if memory serve me correctly, I don’t recall anyone else pointing it out. Would that be true? Here in Japan we’ve been suffering from a record-breaking heat wave since mid-July. The “picture worth a thousand words” above tells everything, indeed. However, and strangely, TV weathermen do not say a word on the strong La Nina at all. They need to get their act together perhaps, La Nina affects different parts of the world in different ways. Look at the SST charts and you will note Japan surrounded by warm waters blown across from the central pacific. Australia usually benefits from higher La Nina rainfall due to the same reason. What do La Nina’s mean for Japan? Re reading your comments I think you are saying the same thing…sorry. Yesterday we had weathermen stating it was the coldest winter in 12-13 years, today we have the BoM stating that it was the 21st consecutive year of above average temperatures during winter. You’d be right if you hadn’t taken my post out of context. I was talking about Lake Eyre here in Aus which does fill every ~100 years or so due to weather events in two other states. Geomagnetic activity is determined by the sun’s total output. Polar fields are not necessarily in sync with it (and certainly not in phase). but these are available only since 1975.
is more than uncertain , unless you judge it by the sunspot polarity, and that as Geoff found out, could be unreliable. “the Earth is not the ideal vantage point to see what happens at high heliolatitudes”. The 2 statements are not necessarily inconsistent. You are right. The BoM is consistent it its drive to promote AGW. If the subtropical jets strengthen on the equatorward flanks then the reason must be compression of the air on the equatorward flank as a result of the El Nino pushing warmed air poleward just as I suggest. Whether the jets then actually do move latitudinally would depend on the net outcome of the interplay between the oceanic pressure from below and the solar induced pressure from above. Sometimes the sun is active and allows the jets to move poleward. Sometimes the sun is less active and the jets are not allowed to move poleward. That would be a consequence of a negative polar oscillation restraining the shift poleward at the time they observed the El Nino event or events used for their analysis. There they agree with me that in a warming climate the jets moved poleward. However it is normally an El Nino that warms the climate. As a result of their confusion over CO2 induced warming their interpretation of the observations is faulty and fails to see the obvious. The fact is that an El Nino will always try to expand the tropical air masses and seek to push the air circulation systems poleward. Whether it succeeds on any given occasion depends on the other factor that I mention, namely the available resistance to that pressure then being supplied by the polar oscillations. Do you have a link to a webpage or study that confirms this? Nobody has pointed that out as a ‘phenomenon’ as it follows naturally from the explanation I gave. It’s like nobody pointing out that you get wet if you walking in the rain. Bob, I think there is another way of looking at the issues you have raised. It may be that I should refer to the combination of the tropics and subtropics and look at their joint response to El Nino rather than just the response of the tropics themselves. ii) In the short term the Hadley circulation intensifies and contracts equatorwards because it is drawn equatorward by the enhanced upward convection over the warmer oceans. iii) However in the longer term as the energy from the El Nino starts to affect the global energy budget for a net warming effect the Hadley cell starts to expand and pushes poleward. Meanwhile the El Nino is fading or a La Nina beginning. iv) That seems to resolve the apparent contradiction noted by Jian Lu. An El Nino might have one initial effect but as it’s influence spreads over time it has the other broader effect. Thus there is no such apparent contradiction. Both stages are a response to El Nino but spread out over time without having to assert that El Nino has one effect and AGW has another. Thus as I have often said a warming troposphere shows a poleward movement of all the air circulation systems and a cooling troposphere shows an equatorward movement of all the air circulation systems and the effect of individual ENSO events is lost in the overall scheme of things. It needs a longer period of time for the background signal to come through in those latitudinal shifts of the jets. Generally we observe a slow and irregular poleward movement during a multidecadal period of warm SSTs and a slow and irregular equatorward movement during a multidecadal period of cool SSTs. Geomagnetic activity is determined by the sun’s total output. No, it is not determined by that alone. Section 9 [page 50+] of http://www.leif.org/research/suipr699.pdf explains the 22-year variation in geomagnetic activity [discovered by Ed Chernosky in 1966]. It comes about by a combination of three causes: 1) the Rosenberg-Coleman effect, 2) the Russell-McPherron effect, and 3) the polarity of the Sun’s polar fields. showing that the effect is still going strong. In short: geomagnetic activity is higher than normal during 11 years centered on even-odd solar minima [observed as far back as 1844] . Should the polar fields not reverse, the higher than normal activity would change to odd-even minima contrary to observations. Apparently you’ve only read the quote I provided and not the two papers in full, because they contradict your speculations. I have read Jian Lu’s paper and he proposes that the climate system response differs between that for El Nino and that for AGW. I have explained how it could work without any such difference being necessary. Lu’s paper is speculation in the way it tries to explain away that non existent dichotomy without damaging AGW theory. A warming world gives poleward jets. He confirms that. He then becomes confounded by the initial short term and unrepresentative climate response to El Nino. El Nino warms the troposphere. A warmed troposphere gives more poleward jets. The initial response to an El Nino is analogous to the initial stages of an explosion. First the surrounding air is drawn inward and sent upward. Then comes the outward blast at all levels. Thus first the slight equatorward shift of the subtropical jets then the poleward shift of all the air circulation systems. But the initial part of that sentence contradicts your earlier speculation on this thread about the expansion of the tropics during an El Niño, which is the topic of discussion. Originally I referred to ‘equatorial’ which could include sub tropics but perhaps unwisely switched to ‘tropics’ at some point. Nonetheless my general concept appears to match the observation of poleward jets in a warming world and the undoubted role of El Nino in creating a warming world. Let me give you a clue, Bob. Rossby waves are also known as planetary waves. I doubt that anyone has ever thought to question their global nature except you just now. Polar fields are too weak to show up on anything, not convinced but I shall read your linked papers, and may come back. For time being here is a link to the relationship between CET, SSN and NAP (North Atlantic Precursor). Soon I shall start doing a bit of writing, no pseudo-science there just data. I suggest study it carefully (one step at the time along x axis), you will have lot of fun in your efforts to negate its conclusion. How can you not be ‘convinced’ when you don’t know the facts? The polar fields are what determines the field in the Heliosphere which regulates cosmic rays and geomagnetic activity and the HCS. I have pointed this out before. Polar field is a minnow. North Atlantic precursor is a killer whale. Regarding your statement, “I doubt that anyone has ever thought to question their global nature except you just now,” I can and will cite papers that discuss the non-global nature of specific types of Kelvin and Rossby waves, so there are others who have questioned “their global nature”. If you read my (September 1, 2010 at 3:15 pm) reply to you above, you will note that I maintained an even keel in it. However, I did not appreciate your attempt to treat and dismiss my question as nonsense. I was allowing you to discover that you were wrong, without my needing to again show you that you were wrong. I will avoid this method in the future and simply provide links to papers that illustrate your error. Just putting up a link to a hi-res global ocean current animation from the US Navy which is pretty interesting. Mainly because the ENSO region currents are way above normal east-west right now and the Atlantic hurricanes are now showing up. i) NASA says this “which seems to indicate that the atmosphere is leading the phenomenon.” The use of the word ‘seems’ suggests speculation and an element of doubt. As it is I disagree with their speculation. They also say this: “causes of the equatorial waves, the source of the equatorial Kelvin wave seems (guessing again) to be the zonal wind stress at the equatorial western Atlantic associated to an atmospheric Oscillation (i.e. MJO). Well my reply would be that the atmospheric Oscillation must itself be initiated by a change in the rate of energy release by the ocean so I consider their speculation to be wrong. Now I do not exclude a top down influence on climate. indeed my hypothesis requires that such an effect be present within the vertical air column. However the density differential between water and air must in my opinion prevent it from having a significant effect on the behaviour of the oceans. In my opinion the oceans vary independently (albeit influenced by total solar energy input), the sun varies independently (having an effect on the upward energy flux through the air column) and climate results from the interplay as the system seeks equilibrium by varying the speed of the hydrological cycle mediated by the latitudinal position of all the air circulation systems. ii)As you point out I initially said this : “I would say that the El Nino by expanding the tropical air masses pushes poleward the air circulation patterns that cause the Trade Winds…” I now accept that I should have referred to tropical and subtropical air masses. Nonetheless my concept is correct overall as Lu accepts i.e, a warmer troposphere results in more poleward jets and I think everyone accepts that a warmer troposphere results from more energy released to the air by the oceans and especially El Nino. So whilst your minor criticism of my terminology may have been correct it takes us nowhere because the underlying point is supported by Lu’s paper. iii) For a long time now you have been challenging me to produce data that shows that the jets move latitudinally at all beyond normal seasonal variation. I have referred you to lots of anecdotal sources concerning their different positions in the MWP and LIA because no such precise data exists. You have now referred me to Lu’s paper which confirms a poleward drift of the jets when there is a warmer troposphere so I ask you to desist on that particular issue. I wonder whether our constant disagreements are due to us talking about quite different phenomena although there is an overlap. Your focus is on short term regional events such as ENSO and the way the Trade Winds interact with the ocean surface. I have no quibble with anything you say within that area of expertise. My focus is on long term global events such as the Thermohaline Circulation and the overall global energy budget. So it is not inconsistent for you or NASA to say that events in the air have a discernible effect on the ocean surfaces but yet for me to say that underlying global oceanic effects set up the large scale air circulation pattern in the background. When I say that El Nino ’causes’ an event such as the shift in the air circulation systems then really perhaps I should say that the underlying processes in the oceans that create El Nino as part of a larger global phenomenon ’cause’ that event. After all I have said that what matters most for the air circulation positioning is the overall net global effect of all the oceans combined and not just El Nino/ La Nina. Indeed one could have varying effects on the air circulation at any given moment depending o0n the state of each ocean at the time. But your comment is also speculation, and is based solely on your beliefs, not on reality. Keep in mind that not all weather is dependent on the oceans. Differences in land surface albedo cause changes in atmospheric circulation. Differences between land and sea surface temperature causes wind. These are impacted seasonally. The temperature of and heat released by oceans are not independent of the atmosphere and they are not influenced solely by solar flux. The SST anomalies of the tropical North Atlantic, for example, rise in response to an El Niño. Wang provides a very detailed description in his “ENSO, ATLANTIC CLIMATE VARIABILITY, AND THE WALKER AND HADLEY CIRCULATIONS” (2005). So SST anomalies can rise in response to an El Niño without the transfer of heat and without a change in solar flux. When North Atlantic trade winds decrease in response to an El Niño, SST anomalies increase. First, an El Niño does not expand the tropics. You accepted this in an earlier comment. Second, “Lu accepts…a warmer troposphere results in more poleward jets…” only when the opposing effects of El Niño events are removed from the general warming. Third, the relaxation of the trade winds in the western tropical Pacific initiates (precedes) the El Niño. During the El Niño, the trade winds in the western Pacific reverse due to the relocation of the convection to the central and eastern equatorial Pacific, a point your conjecture overlooks. This is wrong, as noted above, because we were discussing your comment about the effects DURING the El Niño, not the effects of the long-term warming. And you have also stated in the past that your discussions of climate cannot be tied to short-term datasets due to noise, so your model and conjecture have no relevance in discussions of short-term processes such as El Nino events, which were the focus of our discussions on this thread. And if your speculations about particular processes are incorrect, as they were on this thread, I will note your error. And one could have varying effects on each ocean at any given moment depending on the state of atmospheric circulation. The oceans and atmosphere are coupled. “The reason that you don’t see much publicity about the causes of El Niño is that we don’t understand the origins of the event. We do, however, have a pretty good understanding of how it evolves once it has begun, and that gives a useful ability to make forecasts 6-9 months ahead for some regions. That is the information you see because that is the present state of reasonably-secure knowledge. Of course, there are a variety of theories, and many scientists are working on various aspects of the genesis, which would presumably extend the predictive skill out another few months or even years. The fact is, at several points over the past two decades we thought we had working theories of what causes El Niño. Unfortunately (or perhaps fortunately for those who like scientific challenges), nature has shown that those theories were at best incomplete. For example, during the mid-1980s a group at Columbia University developed a fairly simple theory and wrote a computer model to produce predictions based on it. This was successful in predicting the 1986-87 and 91-92 events almost a year in advance, and they were (figuratively?) breaking out the champagne. Then along came the event of 1993, then another in 94-95, and most prominently the present event, none of which developed according to the ideas in their theory. I think that is a realistic assessment of the situation. I am looking at ways to resolve the causation issues for ENSO and the entire climate system. It is clear from the levels of uncertainty that I have nothing to be embarrassed about if you find apparent inconsistencies between what I propose and what you observe. In particular I have proposed a bottom up oceanic and top down solar interplay that could well initiate and direct both ENSO events and air circulation changes. You are looking almost exclusively at events after ENSO is already under way and I would accept that those short term regional events may well be very different from the long term global processes that must underlie them. Of course they are but the net energy flow is always from sun to ocean to air to space so net long term changes always come from the sun or from the modulating effect of the oceans. Events that might be regarded as caused by the air are just minor localised short term variations in the unidirectional net flow. Any significant long term variation therefore has to come from sun or oceans or a combination of the two. However even in the short term a single El Nino in producing a larger body of warm air above the ocean surface must be expected to alter the air circulation above and over time will lead to a warmer troposphere and poleward jets. They are not dependent on the atmosphere either. My proposition is that the internal mechanics plus the size and density of the oceans make them substantially independent (in energy flux terms) of atmospheric effects but not immune to them. All you are doing is dealing with the short term localised exceptions to the general rule and then pronouncing that there is no more to consider. Stephen and Bob; Have you considered the 27.32 day and 18.6 year effects of the declinational component of the Lunar affect on atmospheric tides, interacting with the outer planet synod influence being a modulated driver of the trade winds and el nino cycles? Here you are auguring about the Sun and the oceans effects on the Rossby waves and the jet stream position, relative to the poles and equator. I don’t see either of you mentioning the effects of the Moon’s multiple atmospheric tidal effects, declinational, diurnal, phase, or moon rise / set times. Could the misunderstanding between the two of you, (due to cycle time constraints) be due to what you are leaving out of the equation? Fall day here in central MN with, wonder of wonders, rain third day running. Half the days since June we’ve had rain. We get 30 inches a year and are up over norm 6 inches in 60 days. La Nina jet stream I’m thinkin’. I’m open to any reasonable suggestion as regards the factors that affect upward energy flux and I’ll have a look at your stuff to see what scale of contribution the lunar effects might have. My initial reaction is that it may exist but be a lower order of effect than solar or oceanic. Bob takes exception to a lot of what I say and I do my best to analyse his comments and see whether I should change my views accordingly. A few times I have needed to change my terms of expression but as far as my main contentions go I accept what he says (mostly) but consider that he fails to look at the wider global picture in which I try to operate. Woods and trees come to mind. They even use the same photo as me !!!! one off event it’s part of a new post 2000 climate pattern. There is a subtle difference in that they repeat Bob’s assertion that an El Nino draws northern hemisphere storm tracks equatorward and not poleward as I contend. I think that what happens is that there might be a short local equatorward shift in the early stages but as the El Nino progresses the warming of the low latitude air that it causes then pushes the storm tracks poleward hence the snowiness as that warmed air mixed with the colder air pushed down by the negative AO. Regardless of the details it seems that climate discussions are coming back on to the correct track along lines proposed by me for some 3 years now. Still however they try to dismiss it as a rare event rather than part of a new pattern.